McMinnville Education Foundation is proud to offer the Artist-in-Residence program. One of MEF’s showcase programs, it has become a fabulous tradition in McMinnville’s elementary schools. Every kindergarten through 5th grade student in the district participates in this dynamic opportunity. Technically, the Linfield Chamber Orchestra field trip is not a McMinnville Education Foundation program. MEF provides transportation funds to bus students to Linfield. Listening to and viewing live classical music in the historical Melrose Auditorium provides a rich cultural experience to all 4th grade students in the district. McMinnville Education Foundation started the teacher mini grants as a way to support teachers’ innovative ideas. With ever-shrinking school budgets, teacher mini grants are more important than ever. Experiential learning thrives when creative ideas can be birthed to life with resources. "In this era of shrinking school budgets, support from the Foundation is essential." The MEF has awarded over $282,000 during the past 14 years to benefit the students of School district #40. The McMinnville Education Foundation was created in 1998 to provide learning enrichment opportunities for students in the McMinnville School District. Located in McMinnville, Oregon, the foundation is a volunteer-driven, nonprofit organization that has made its mark by funneling money directly into our children’s classrooms and promoting educational excellence for all students. View the prettiest spring fashions from Mes Amies, modeled by district teachers and staff. The annual fashion show and luncheon welcomes its guests with a delicious meal prepared by Rogue Gourmet Catering (includes wine and dessert.) Before lunch is served, attendees have the opportunity to bid on silent auction items and purchase raffle tickets for donated gift baskets. Second graders study insects at Miller Woods. 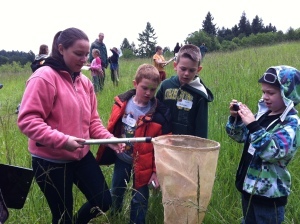 Miller Woods – The McMinnville Education Foundation partners with the Yamhill County Soil and Water Conservation to provide an outdoor laboratory for students to use at Miller Woods. Elementary and middle school students have the opportunity to participate in hands-on field research with water quality, pond ecosystems, forestry studies, and animal habitats.